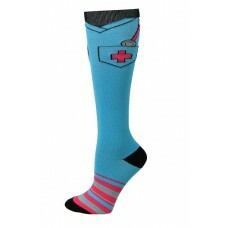 Premium X-Large Medical Icons Fashion Compression Socks in Bulk. Think Medical's Premium X-Large Medical Icons patterned compression socks are engineered using a 200 needle count construction. This results in a long-lasting compression sock that provides advance compression in areas needed most. Veins, arteries, and muscles are squeezed gently, moving the blood up towards the heart, preventing blood from pooling in the feet. Compression socks apply the most pressure at the ankle and gradually less as they go up the leg. 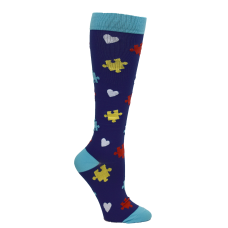 Our socks use a moderate compression level of 10-14 mmHg which is the most versatile and is perfect for everyday use. Compression Socks are available in wholesale and bulk orders only. Ultra-Soft Fashion Compression Socks in Bulk. Think Medical's Ultra Soft patterned compression sock..
Scrub Top Fashion Compression Socks in Bulk. Think Medical's Scrub Top patterned compression socks a..